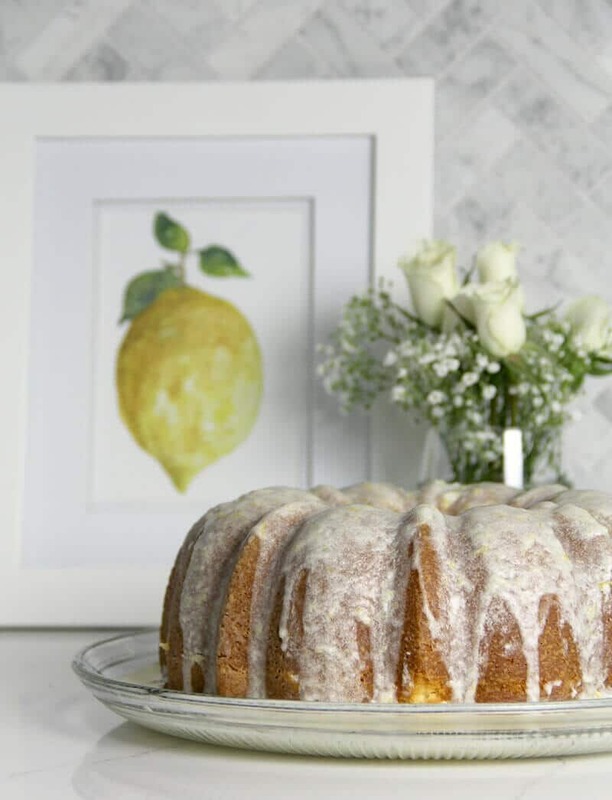 Easy Lemon Pound Cake with Lemon Glaze is a simple recipe using the Cream Cheese Pound Cake base and adding a zesty lemony glaze—it’s fresh, pretty, and lip-smacking good! Pound cakes are ubiquitous to any Southern gathering that includes food…and isn’t that every Southern gathering? A lot of old pound cake recipes, while they have a nice flavor, still have a tendency to be dry and heavy. 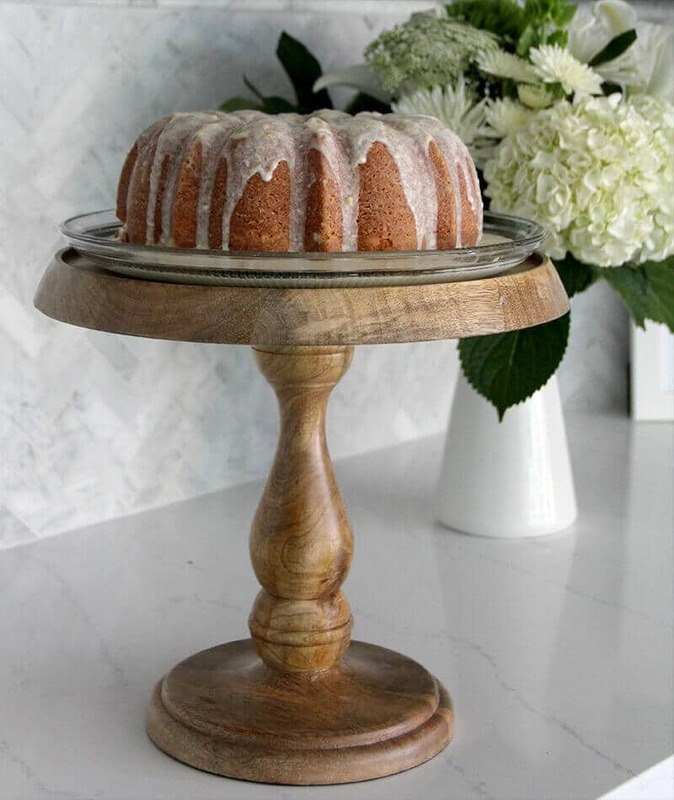 That’s why my absolute favorite pound cake recipe is the one I’ve been making for about thirty years now, this Cream Cheese Pound Cake recipe. It’s consistent and easy, moist every time and always delicious. 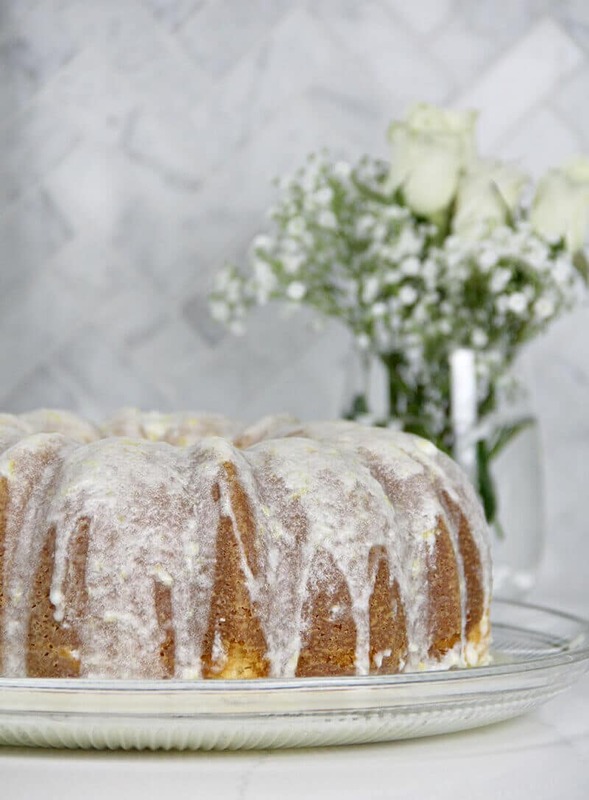 So naturally, when I wanted to come up with a Lemon Pound Cake recipe, I figured just adding lemon juice to the Cream Cheese Pound Cake would be the best place to start. Usually when baking a cake you have to be careful with making changes because the cake won’t rise properly or the texture will change. That didn’t happen with this cake, which is another reason I love this recipe so much. I played around with varying amounts of lemon juice until I came up with an amount that lent fresh, lemon flavor but didn’t affect the texture of the cake. 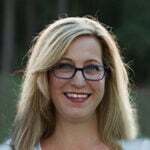 The basic pound cake recipe calls for one package of cream cheese mixed with 3 sticks of butter, 3 cups of sugar, 6 eggs, 3 cups of flour, 1/8 teaspoon of salt, and 3 teaspoons of vanilla extract. To this I added 1/3 cup of lemon juice, 2 teaspoons of lemon zest, and a pinch of baking soda. Then to top it, I made a glaze with fresh lemon juice and zest, powdered sugar, and a touch of melted butter. Some of the glaze goes on while the cake is still a little warm, so some of it soaks down into the cake, then the rest of the glaze is poured over the cake once it’s cooled. 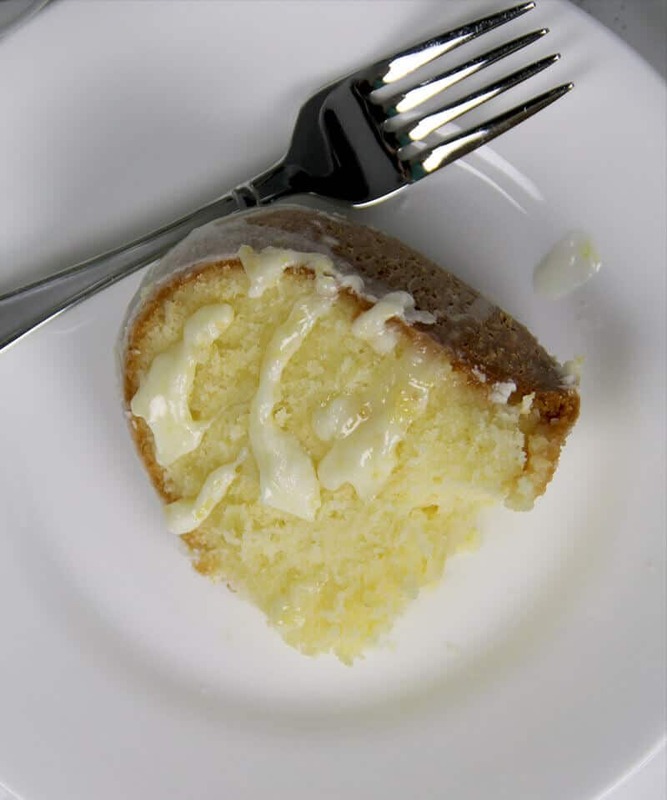 The result is a tender crumb but dense lemon pound cake with lemon glaze that is fresh and zesty and a lovely addition to any gathering. 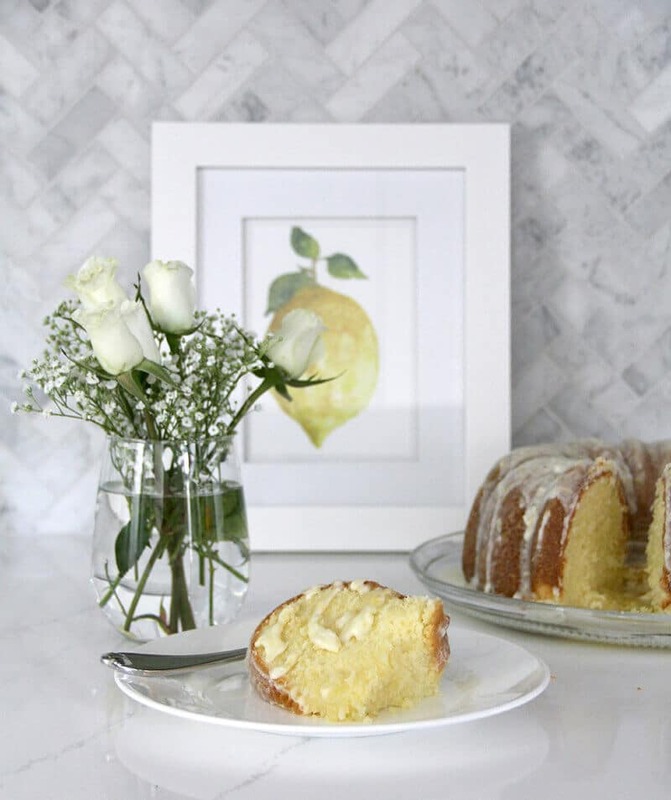 Easy Lemon Pound Cake with Lemon Glaze is a simple recipe using the Cream Cheese Pound Cake base and adding a zesty lemony glaze—it's fresh, pretty, and lip-smacking good! Do not preheat the oven. Butter and flour the large Bundt or tube pan. You may want to set the pan on a cookie sheet covered with foil in case the cake overflows while baking. Beat butter and cream cheese at medium speed of electric mixer until blended, then turn up to medium-high for about 8 minutes. Gradually add sugar, beating another 5-7 minutes on medium-high. The batter should get very creamy and light with no discernible pieces of cream cheese. Add eggs, one at a time, mixing on low to medium just until yellow disappears. Add vanilla. Add flour to batter, a little at a time, beating on low speed just until blended. Be sure to scrape the sides and bottom of bowl to blend every bit. Add lemon juice and zest to batter and beat on low speed until blended. Pour batter into the prepared pan and place in cold oven along with a 2 cup oven-proof measuring cup filled with water (about 1 ½ cups). Bake at 300° for 1 hour and 15-30 minutes or until a wooden pick inserted in center comes out clean or has just a few crumbs. Start checking about 1 hour and 15 minutes. Let cool in pan on wire rack for 20 minutes then flip onto wire rack. You can then flip back onto a cake platter so that the bottom of the cake becomes the top or just leave it as is. Beat confectioner’s sugar, lemon juice, melted butter, lemon zest, and salt together until smooth and well blended. Pour half the glaze on slightly warm cake. Allow cake to cool and pour the rest of the glaze over cake.